BEST NEIGHBORHOODS IN PEARLANDOne of the fastest growing cities in the US, Pearland is home to several master-planned neighborhoods, top-ranked schools, and golf-course communities. One of Houston’s Best Suburbs, Pearland features a rural, small-town vibe just 25 minutes south of Downtown Houston. Nestled between Highway 288 and Highway 35, Pearland is a popular suburban destination due to its highly-rated schools, master-planned communities, and growing commercial centers. 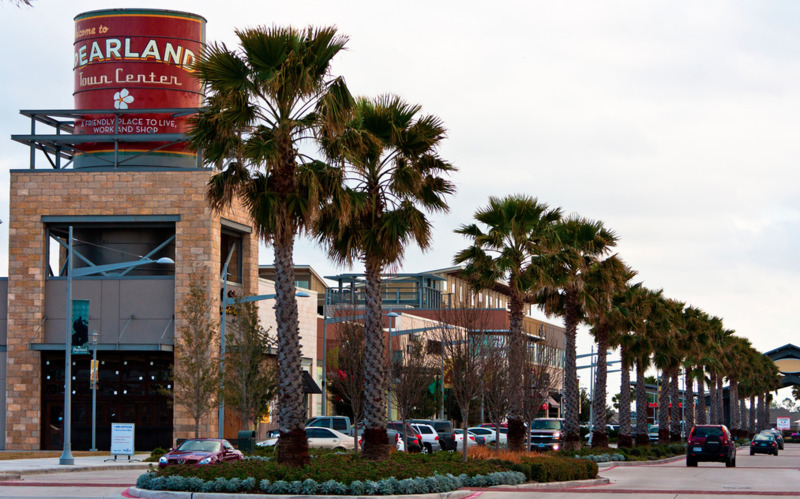 Pearland Town Center is an outdoor mall offering residents a variety of choices in restaurants and retail shops. Parks and recreation facilities like golf courses and trampoline parks also provide Pearland homeowners with plenty of leisure and exciting activities. Pearland is one of the fastest growing economies in the U.S. over the past seven years. Pearland is ranked 3rd by a WalletHub report which compared 515 cities across the U.S.
Pearland has seen a dramatic increase in real estate appreciation the last 10 years. The average new construction home is around $270,000 in Pearland (See Salary Needed To Buy Home In Houston). The suburb’s amenities, top schools, commercial development and location are main drivers of this growth. Pearland communities that didn’t flood during Hurricane Harvey or the recent storms. Find our ranking of the Best Pearland Neighborhoods below, complete with our methodology and sources at the footer. 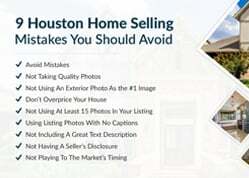 Get personalized recommendations on Pearland neighborhood homes for sale based on your budget, school preferences, and commute by contacting the #1 Keller Williams Realtor in the State of Texas, Paige Martin, and her Houston Properties Team. Enter your email to get this free Pearland guide in easy-to-read PDF format. See neighborhoods near top schools, communities with best amenities, and more. The Pearland Independent School District (ISD) is one of the best performing school districts in Texas (See Houston Guide To Best Schools). It has a 94 rating from Texas Education Agency (TEA) – the third highest in the state of Texas – out of school districts of 10,000 or more students. Listed here are schools that have received the highest GreatSchools.ord rating and the neighborhoods that they serve. Most of these schools have received the “Met Standard” approval rating from TEA and have students who tested higher than the national average. To find an updated listing of all Pearland real estate zoned to any specific public school, please send an email to Paige Martin at Paige@HoustonProperties.com. Located along Pine Crest Drive off Dixie Farm Road, Pine Hollow Estates is a quiet, upscale community of single-family homes in east Pearland. 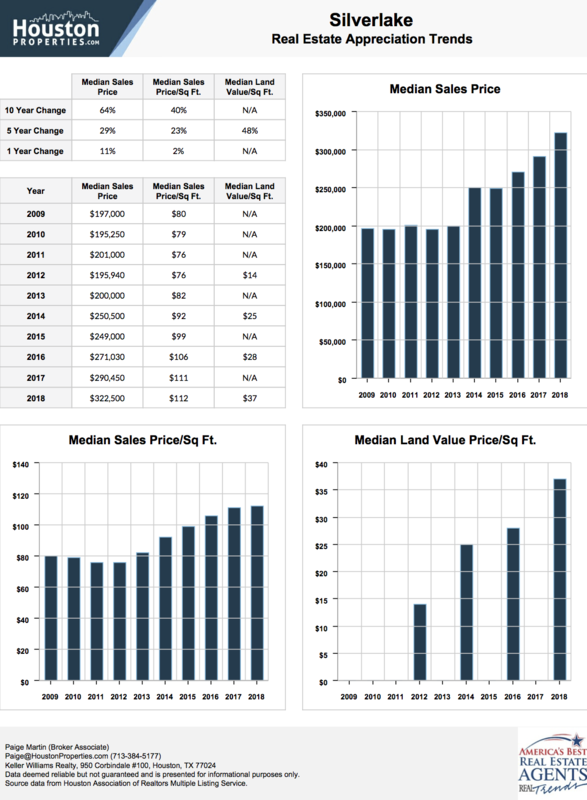 With a median sales price of around $500,000, homes in the area are also among the most expensive in Pearland. The streets of Pine Hollow Estates are all lined with beautiful, mature trees. Residents get to enjoy amenities such as walking and biking trails, two playgrounds, basketball courts, and a community park. The largest master-planned community in Pearland, Shadow Creek Ranch covers 3,500 acres—150 acres are dedicated to recreational facilities. Residents of more than 50 subdivisions enjoy access to the community’s 50-acre Shadow Creek Ranch Sports Complex and Diamond Bay Water Park. Development is ongoing for The Reserve at Shadow Creek, which “combines the finest in office, retail, residential, and hospitality uses” along Highway 288. There are also plans to put up six schools within the community to accommodate student demand as development continues to grow. One of Houston’s Best Golf Course Communities, Silverlake is a 1,000-acre master-planned community located less than 15 miles south of Downtown Houston. One of Pearland’s first master-planned communities, Silverlake features homes built around a 29-acre lake and a world-class golf course. In addition to the Southwyck Golf Club, residents have access to numerous amenities including hiking/biking trails, swimming pool, clubhouse, and recreation centers with tennis courts and baseball/soccer fields. Located west of Highway 288, the 525-acre master-planned community of Southern Trails is popular choice for golf lovers. 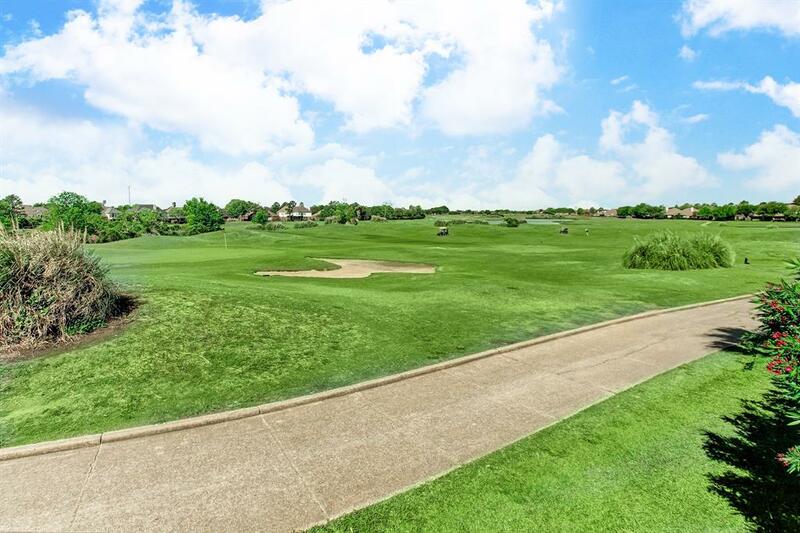 It is only minutes away from the Pearland Golf Club and Southwyck Golf Club. It also features a fitness center, lakes and fountains, and a clubhouse with fireplace and kitchen. The median sale price for Southern Trails homes is around $345,000, although some properties can sell for over $600,000. Southlake is a 315-acre, master-planned lakeside community of single-family homes located off of Highway 288. It includes The Park at Southlake, which features playgrounds, a park, and a swimming pool complex. 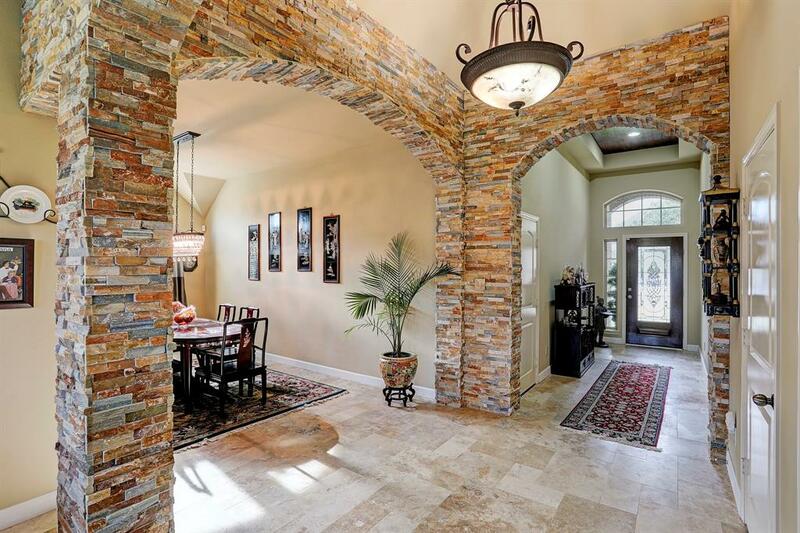 Southlake homes typically sit on quarter-acre lots, with 4-5 bedrooms and 3-4 bathrooms. 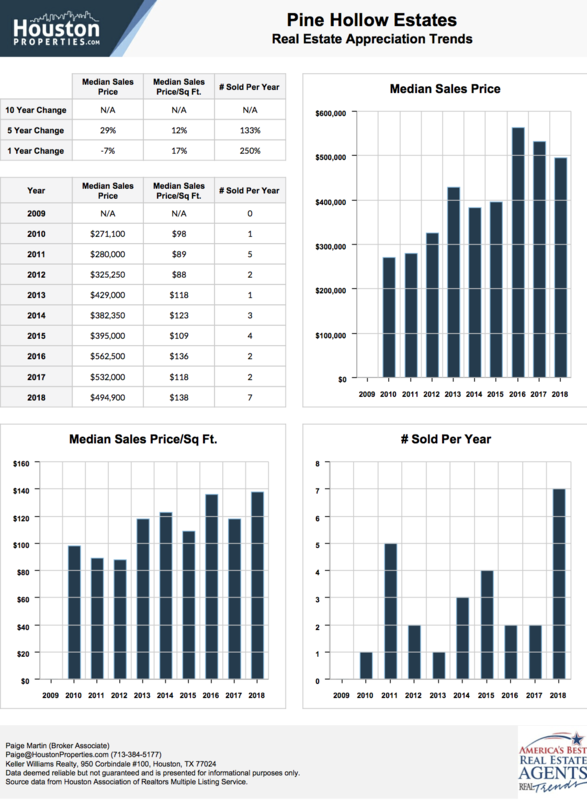 The median home sale price is $402,118, with some properties selling for upwards of $700,000. 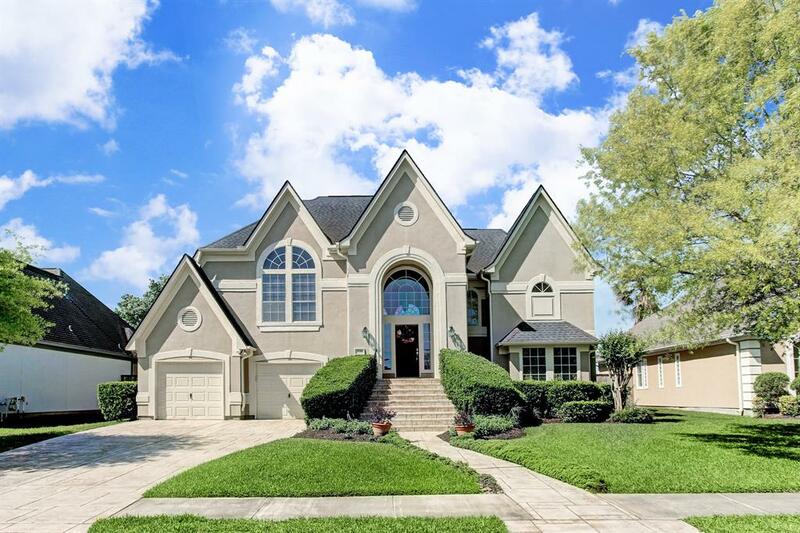 For more data on the other top Pearland neighborhoods with good schools for custom list of homes zoned to top rated Pearland schools, contact Paige Martin, ranked as the #1 Individual Agent with Keller Williams in the city of Houston. Highland Crossing is one of the new construction neighborhoods in Pearland and is located just off McHard and Old Alvin Road. With a prime Pearland ISD location, the neighborhood is within reach via its easy access to the Sam Houston Tollway – the tollway that forms part of the Texas State Highway Beltway 8 that crosses the Houston Ship Channel on the Sam Houston Ship Channel Bridge and forms a gap between Interstate Highway 10 and State Highway 225. Part of the Brazoria County, Highland Crossing’s location is within the greenbelt area which makes it in close proximity to nature parks and trails. It is also just 25 minutes away from the bustling downtown Houston, providing residents with quick access to shopping, dining and schools served by the Pearland Independent School District. A master-planned community which boasts a serene lakeside setting, Pearland Lakes is a new single-family home development located just north of the Silverlake area in Brazoria County. Accessible from Pearland Lakes is State Highway 288 which connects the neighborhood to other key places in Houston like the Medical Center, Downtown, and the Galleria area. It also directly connects to Beltway 8, another major road which links Pearland Lakes to major job centres in Harris County. Residents can enjoy walking paths and parks, as well as quick access to restaurants, shopping centres, and entertainment venues. 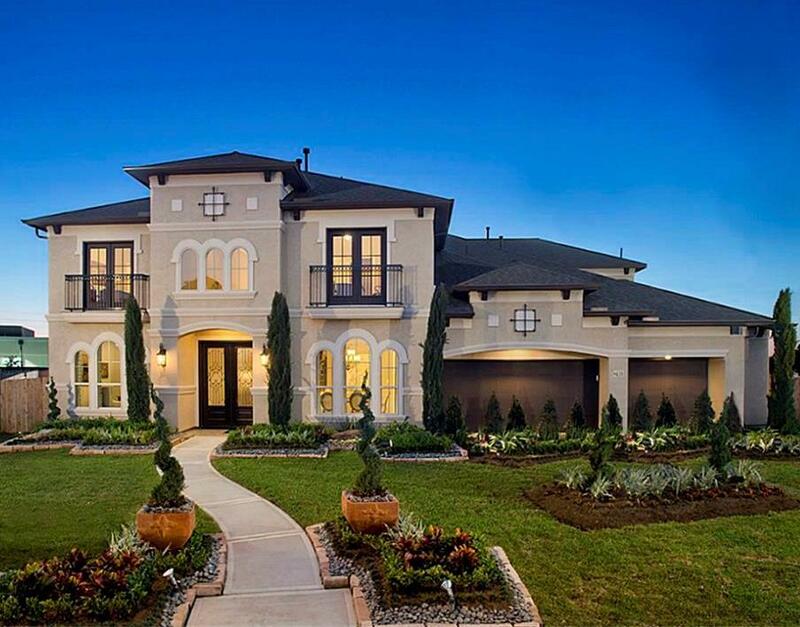 The developer of Pearland Lakes, Beazer Homes, are known for building ENERGY STAR homes. This means that homeowners can enjoy low utility expenses, spray foam insulation, and Low E Thermal Pane windows. Opening its gates in 1995, Silverlake has fast become one of the most successful developments and prolific newly opened neighborhoods in 2002. The community is strategically located only 14 miles south of Houston’s Central Business District, 16 miles south of the renowned “Uptown” Galleria area and only minutes from the Reliant Center, Greenway Plaza and the world renowned Houston Medical Center. Residents also enjoy the convenience of being surrounded by numerous dining and shopping options as well as schools and entertainment venues. Shadow Creek Ranch is designed to provide convenient access to some of Houston’s business districts and entertainment hubs. Texas Medical Center is only a 20-minute drive from the community via State Highway 288, as well as Downtown Houston and the Inner Loop neighborhoods. It also gets direct access to Energy Loop through Beltway 8. It has 300 acres of lakes flow in this 3,500-acre lake themed master-planned community. Shadow Creek Ranch has four recreation centres which includes swimming pools, sand volleyball courts, picnic pavilions, and full-sized tennis courts. Residents will also get to enjoy some of the Best Golf Course Communities, located just minutes away from Shadow Creek Ranch. Less than 15 miles away is The Golfcrest Country Club, while 3.3 miles southeast of the community is the Southwyck Golf Club. Built around 2006, the Stonebridge community inside Brazoria County saw further expansion in 2013 primarily due to the market demand because of its convenient location. Located in central Pearland, Stonebridge is just off the Pearland Parkway and is within close proximity to Beltway 8. 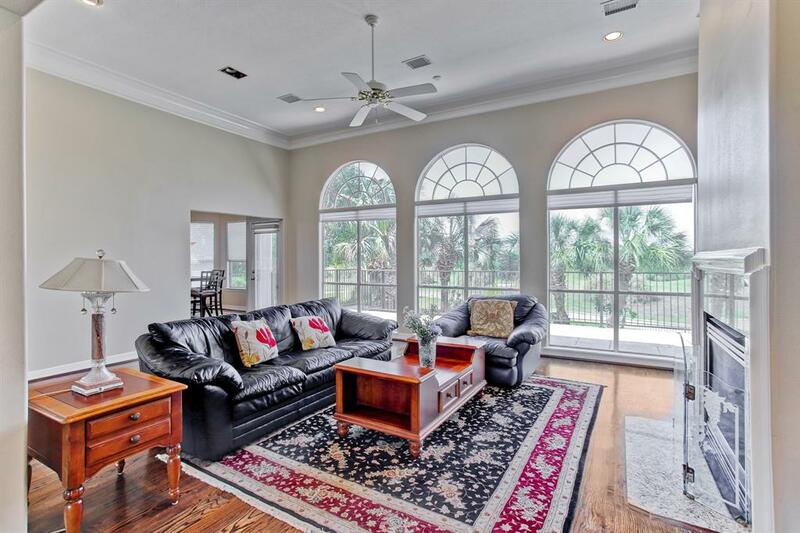 With its easy access to the 288 and I45, residents of this upscale gated community can relax and enjoy its surrounding parks, lakes and nature trails. Stonebridge is also near the Medical Center, The Galleria, the Baybrook Mall and is a few minutes away from Downtown Houston. One of Pearland’s most expensive neighborhoods, the lakeside community of Lakepointe at Silverlake tops our list of communities with best appreciation. 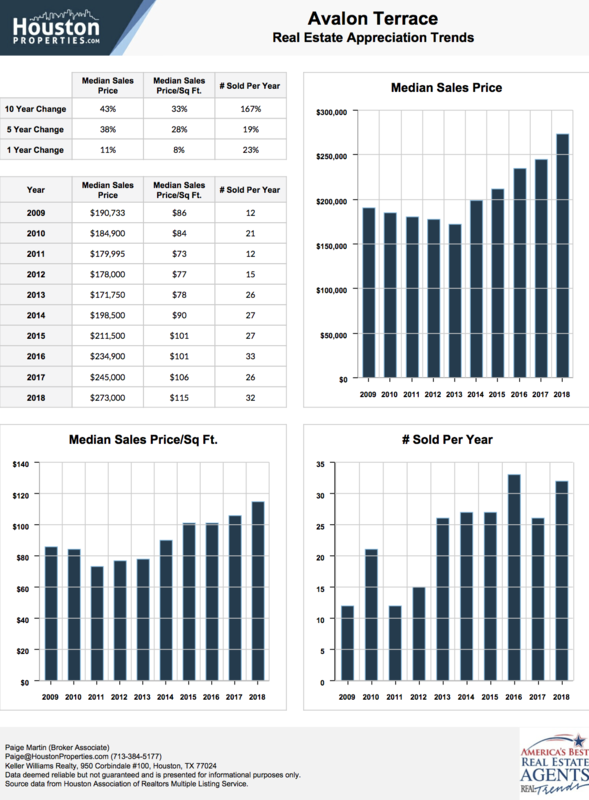 The past year alone saw the median sales price of homes go up by over 30%. Part of the larger master-planned community of Silverlake, Lakepointe typically features two-story, single-family homes that sit on quarter-acre lots with 3–5 bedrooms. The median sales price for Lakepointe homes is over $450,000, though some properties can sell for upwards of $700,000. Located within one of Houston’s best suburbs, Avalon Terrace is a boutique community of about 500 single family properties in Pearland. 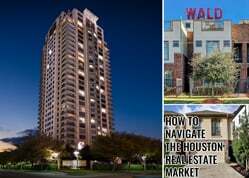 Its proximity to major roads such as Highway 288, Beltway 8, and FM 518 makes it easy for residents to drive to and from key Houston areas like Downtown Houston and Texas Medical Center. These are only typically available on the market for 82 days before being purchased close to its asking price. 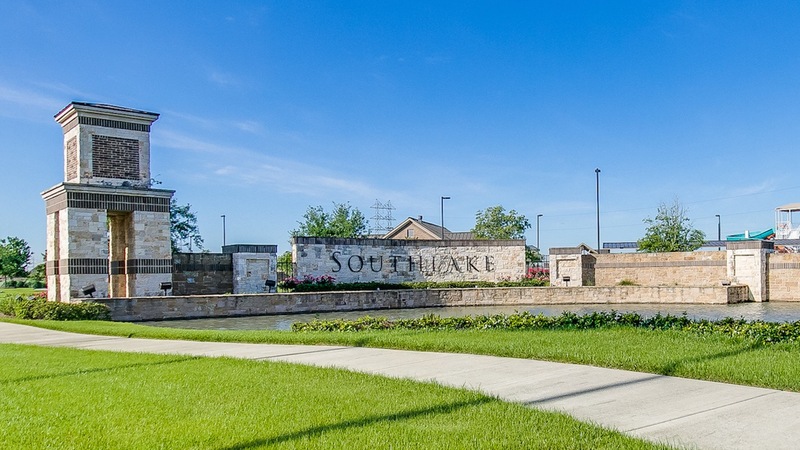 Dating back to its development in 1985, Southwyck subdivision is one of the fastest growing communities in Pearland with over 30% sale appreciation in five years upon purchase. Its high demand is mainly due to residents gaining access to the prestigious Southwyck Golf Country Club – an 18-hole golf course by the lake suited with the best amenities such as 2200 square foot banquet facility that overlooks the golf course. Its home values that ranges between $155,000 – $875,000 and sit on quarter-acre lots with four bedrooms and two bathrooms. Autumn Lake’s affordable homes and high-performing schools are just some of the top reasons properties in the community continue to sell well. The past year saw property values rise by 9%, bumping up the median sale price of homes in the lakeside community to $257,950. Featuring around 120 single family homes, Scofield can be found within Silverlake, one of Pearland’s first master-planned communities, with newer construction homes dating back to 2004. The quarter-acre lots post home sale prices between $250,000 to $390,000. Homes for sale in Scofield At Silverlake are only available in the market for an average of 67 days, before they are purchased close to its asking price. The average value of each property are priced at $105 per square foot and list for $320,000. Nestled in East Pearland, the community is home to 284 single family properties with 2,666 Median sq. ft.
With both its convenient location and mid-range home prices, Dixie Woods’ 10% increase in between a five-year appreciation is one of the best in the area. Property values range between $211,000 to $271,000 and most homes at valued on average at $250,000. They typically sit on quarter-acre lots with four bedrooms and two bathrooms equipped with its own garage. A small community located on the east side of Pearland, Pine Hollow Estates is one of the new construction neighborhoods in the area. Owing to its exclusivity, this neighborhood features 63 single family properties which sit on half-acre lots, about 3,494 median square feet. Each home in Pine Hollow Estates enjoy energy efficient features to lessen utility costs, as well as new construction upgrades like tech shield, granite counters, and dual pane windows. Pine Hollow Estates is considered an upscale neighborhood because home sale prices range between $325,000 to $690,000, with an average typical listing of $455,000. At an impressive sale price appreciation increase of 35% spanning across 10 years, home investments in Silverlake is one of the best recorded. Sitting on over 1000 acres of master-planned community, Silverlake includes over 4,500 completed single family homes with values that range between $150,000 to just under $1 million. With homes typically purchased at close to asking price, the average price range is usually within $190,000 – $650,000 and sit on quarter-acre lots with four bedrooms and two bathrooms. Posting a 26% increase in its 10-year appreciation, Bellavita At Green Tee is a luxury neighborhood of 618 single family properties. Newer constructions homes here were built as recently as 2013, but the performance of the neighborhood in the market is good enough to pique the interest of homebuyers and investors. They typically list for around $255,000. Bellavita homes available for purchase usually last for about two months. Mostly featuring large homes, the gated community boasts 39 single family properties with 2,564 Median Square Feet. At 19% increase in its 10-year appreciation value, buying a home in Parkside At Pearland is one of the best investments you can partake. The exclusivity of owning a piece of the 39-property set gives the home a higher value overtime. 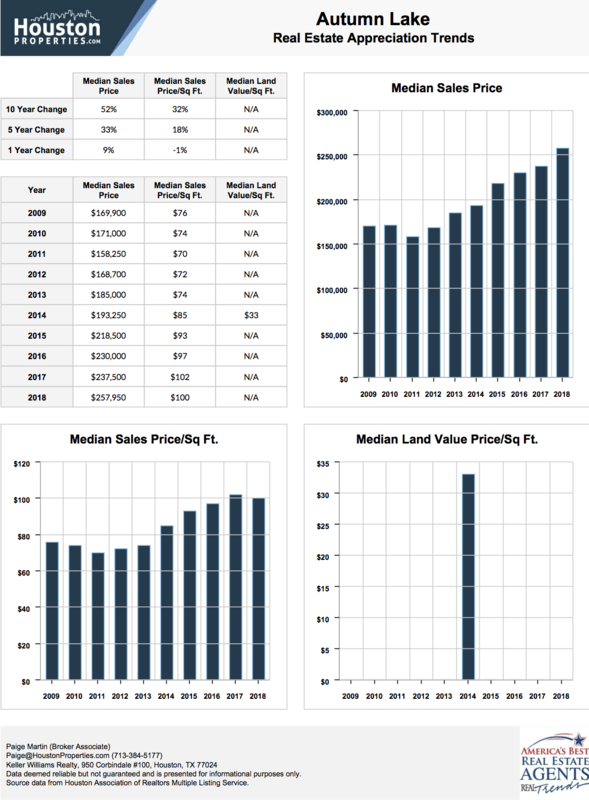 Ranging between $206,000 to $286,000, the median appraised value is $ 94.60/ sqft. 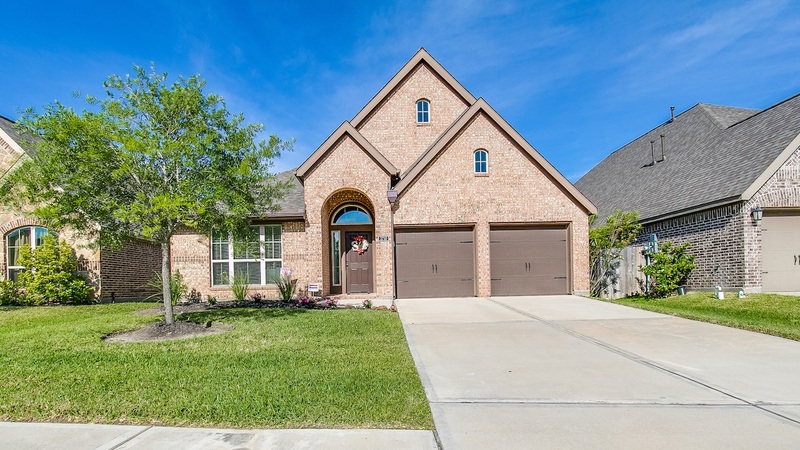 Homes in Parkside at Pearland typically sit on average-sized lots with four bedrooms and three bathrooms with its own garage and average listing price is around $255,000. 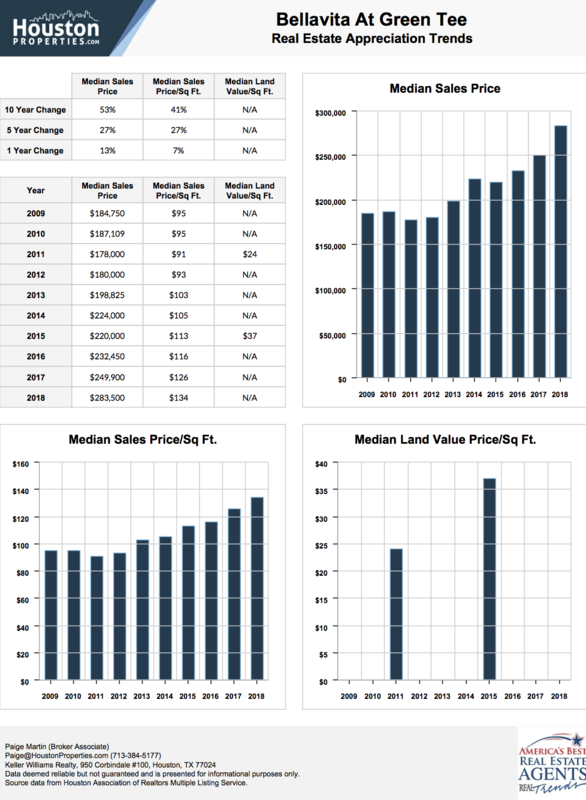 For updated information regarding real estate pricing and trend analysis of Pearland neighborhoods, please contact Paige Martin at Paige@HoustonProperties.com. Located in Harris County, Tuscany Estates is one of its most exclusive neighborhoods with only 149 single family properties. Each home averages 3,555 median square feet, most of which were built since 2004. 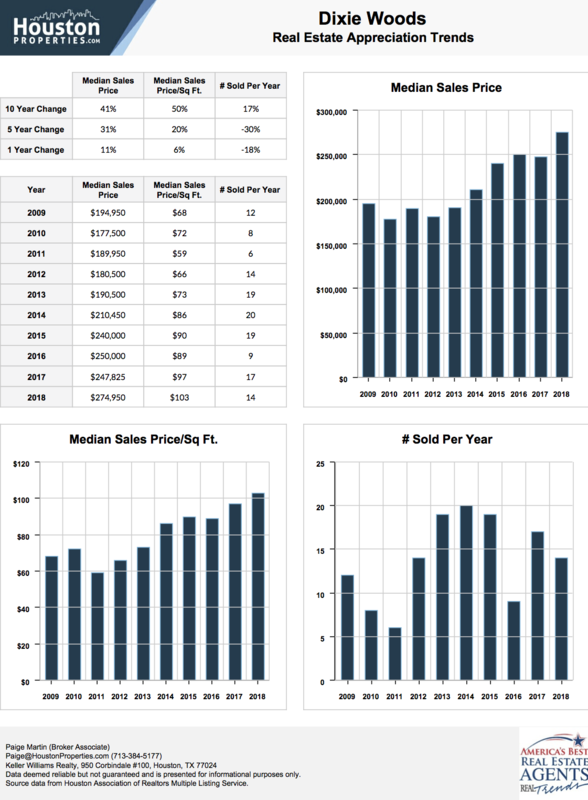 Its median home sale price is at $670,000. The average Tuscany Estates home has four bedrooms and three bathrooms, with over 10,000 median lot square feet. With only 39 single family properties, the Jenkins neighborhood is lauded as second most expensive community in Pearland. With its median home sale price averaging at $565,000, potential buyers are looking at home values that ranges between the $217,000 to $538,000 mark. Recent homes sold in the Jenkins neighborhood are typically two-story homes that occupy property sizes that range between 2,400 to 3,700 square feet. 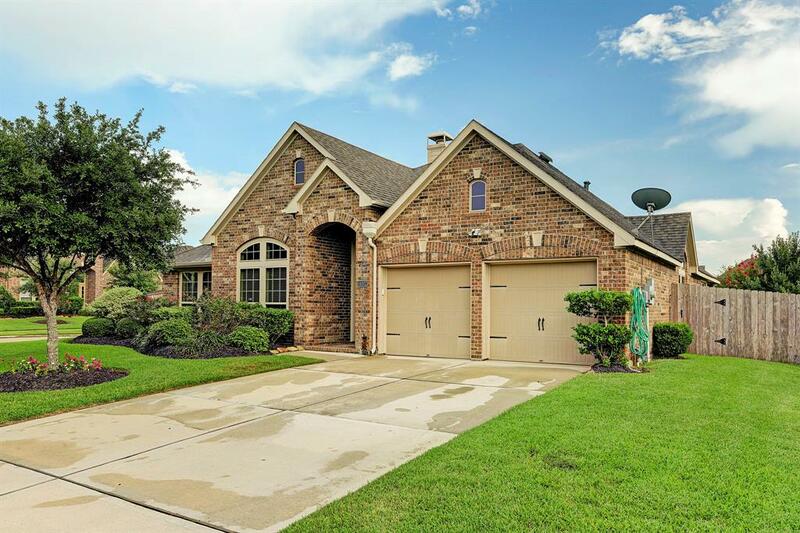 Found at the central part of Pearland, Ravenwood Estates is a small county neighborhood with 69 single family properties with an average size range of 2,267 to 5,242 square feet. Most homes have a three to five bedroom capacity, and two to six bathroom capacity. 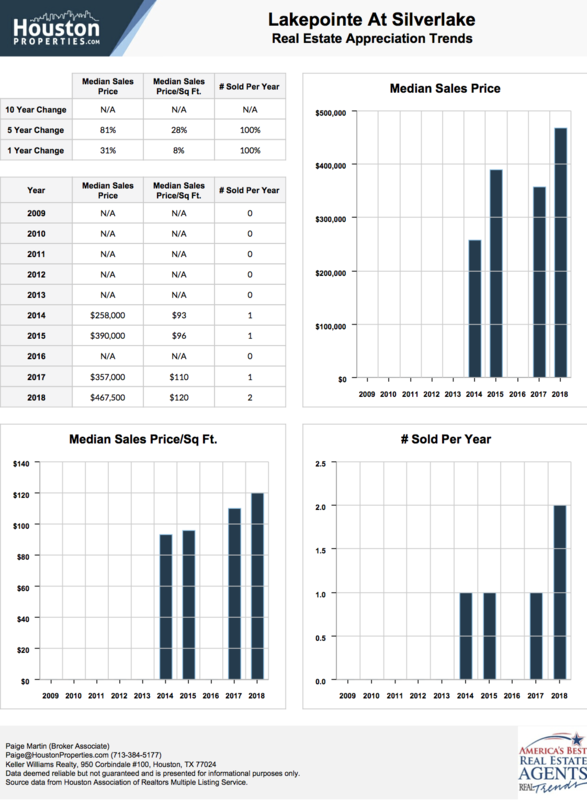 The median home sale price of Ravenwood Estate averages $525,000, with a median sale price per square feet of $134. 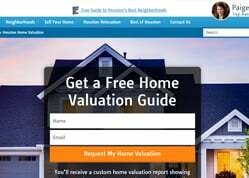 In general, the average home values ranges between $265,000 to $725,000. Homebuyers should note that most Ravenwood Estates homes are only in the market for 77 days and are usually bought close to its asking price. As one of the top 10 most expensive neighborhoods in Pearland, Lakeside Estates is home to 33 single family properties with 3,433 Median Square Feet each. Lakeside Estates feature larger homes that are at $131 per square foot and typically list for around $465,000. The value has gone up over the years especially during its completion in 2005 wherein newer homes can go as high up as $610,000. Properties sit on an expanse of one-acre lots with four bedrooms and three bathrooms, allowing vehicles to be housed in garages or parked in the driveway. Zoned to the top ranked Pearland ISD, Pine Hollow Estates enjoys access to premier educational institutions as well as key Houston neighborhoods and employment districts. 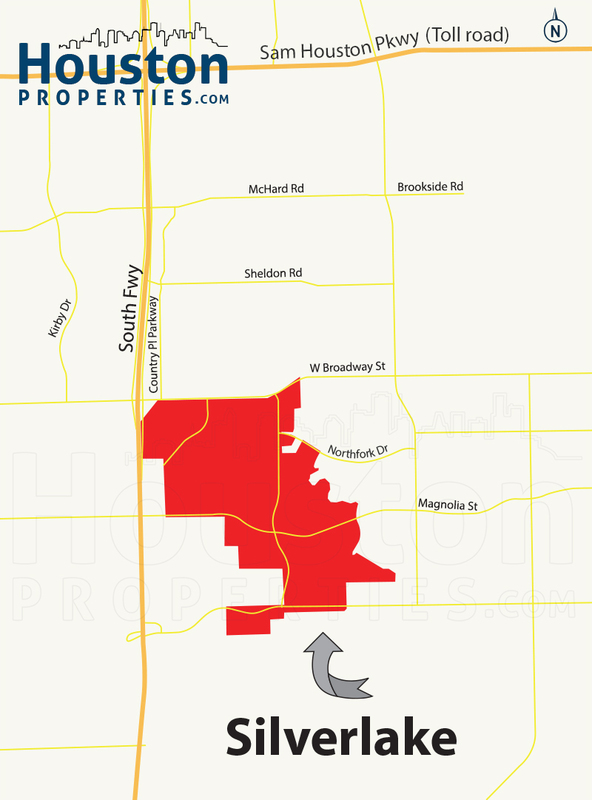 There are 63 single family properties in Pine Hollow Estates, each sitting on half-acre lots with a potential capacity of four to five bedrooms and two to five bathrooms. 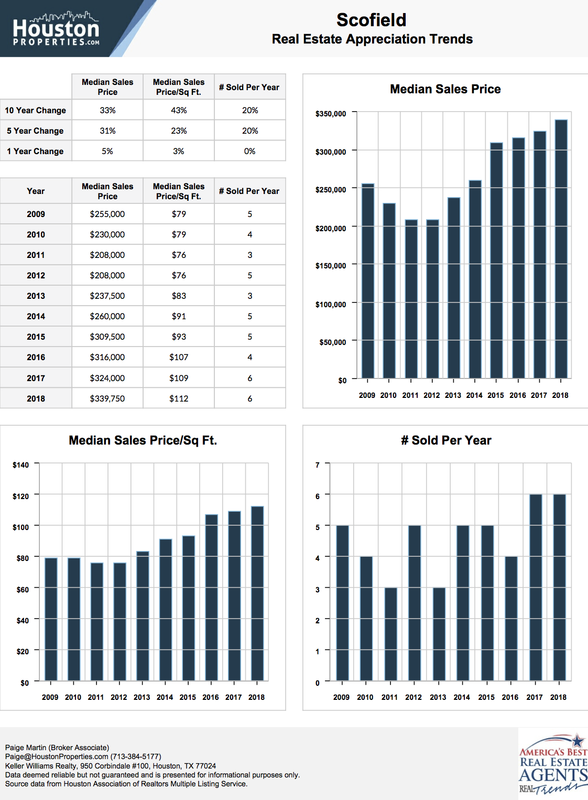 With properties which have a 3,494 median square feet, priced at $138 per square feet, the calculated median home sale price is at $494,900. For this reason, potential buyers should expect a home price range of $325,000 to $690,000. With its median home sale price at just a little below $500,000, homes in Waterbury Estates at Silverlake is one of the most expensive neighborhoods in Pearland. These luxury homes feature at least five bedrooms and 4 bathrooms with a $113 per square foot tag and typically listed for around $455,000. Waterbury Estates is home to 110 single family properties with 4,028 median sq ft. and ranging between $418,000 to $522,00. With its close proximity to the Southwyck Parkway, this community provides convenient accessibility to a lot of shopping and dining options surrounding its area. Lakepointe is part of the mixed-use, master-planned community of Silverlake. 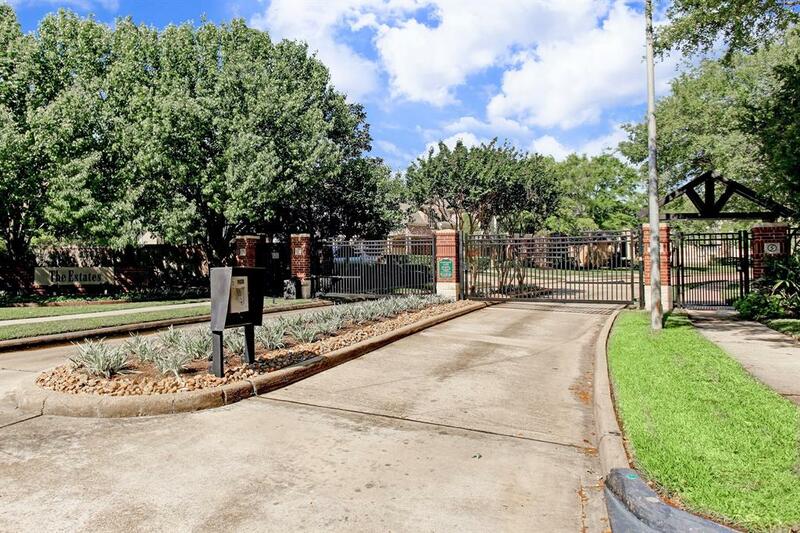 It enjoys proximity to some of Houston’s best dining and entertainment districts, as well as access to hike and bike trails, picnic areas, and other recreational facilities. Featuring 141 single family properties with a lot range of 2,614 to 5,117 square feet, these homes sit on quarter-acre lots with a three to five bedroom and two to four bathroom capacity. Per square feet Lakepointe At Silverlake lots are priced at $120 with a median home sale price of $467,500. Expect to find homes valued between $285,000 to $620,000. Located within the Brazoria County, the neighborhood boasts of 62 single family properties with 3,426 Median Square Feet. 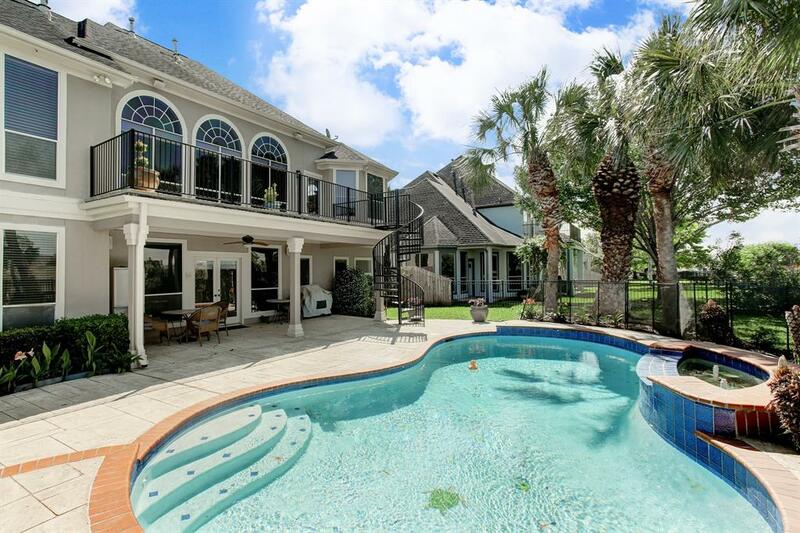 The latest real estate market report shows that Crestwood Cove At Silverlake is one of the most expensive and exclusive Pearland neighborhoods – with homes being valued between the $322,000 to $424,000 range. These homes are about $260,000 – $480,000 and sit on quarter-acre lots with four bedrooms and three bathrooms. 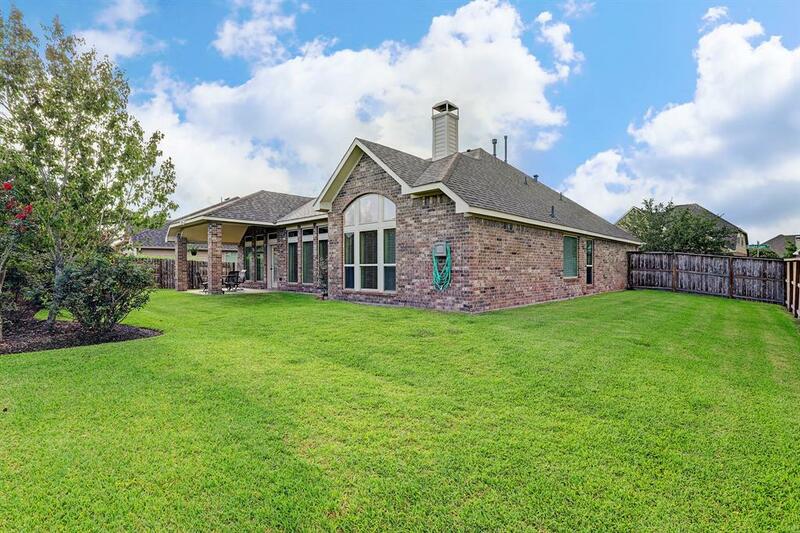 Crestwood Coves is within close proximity to the Bayou Bend, River Oaks and the Avalon Place and is within a short driving distance to Downtown Houston. Another Silverlake neighborhood which enjoys lakefront views, a world-class golf course, and luxury amenities exclusive to residents of this master-planned community. Springbrook at Silverlake features 178 single family properties which sit on quarter-acre lots. Each home has an average capacity of three to six bedrooms and two to four bathrooms. At $122 per square feet, homebuyers are looking at a median home sale price of $440,000, with home values which range between $290,000 to $475,000. Home to a total of 41 single family properties, the Sheldon Cove at Silverlake is a well sought-after neighborhood in Pearland. 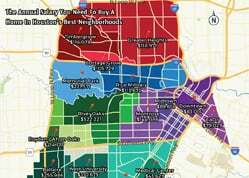 This is primarily due to the property sizes ranging from 3,337 to 4,098 sq. Ft. This makes one property’s median square feet at 3,583. Homes in Sheldon Cove sit on quarter-acre lots with five bedrooms and three bathrooms and are valued between $324,000 to $423,000. They are being sold at $113 per square foot and are listed for around $380,000 on average at less than 90 days. The Shadow Grove Preserve is a community of homes developed by KB Home. It has convenient access to Highway 288, Sam Houston Tollway, and Highway 6. Shadow Grove features single family properties with spacious lots. Located within the Pearland neighborhood, new construction homes in Shadow Grove features homes that sit on quarter-acre lots with a three to four bedroom and two to three bedroom capacity, and an average selling price of $290,000. Shadow Grove features amenities which include free use of the recreation center, pool, park, and sweeping lake views. Residents will also take pleasure in its proximity to entertainment districts like the Shadow Creek Ranch Town Center and Pearland Town Center. Shadow Grove has access to key Houston areas like Downtown Houston, William P. Hobby Airport, and Pearland Medical Center. Bakers Landing is on the newest communities being developed by DR Horton in the Pearland neighborhood. The 80-acre property is centrally located in Pearland and is just off Hwy 55 making it easily accessible to Beltway 8. The community also have a wooded reserve that go around the lake and a fishing pier. Residents can also leisurely enjoy Bakers Landing’s two parks with nature paths and trails. The location makes it conducive to go on quick drive to Downtown Houston or get to Houston’s Medical Center. Residents will have access to numerous shopping and dining options as well. Bakers Landing will be home to 200 single-family homes and 50 townhomes once completed. On-going sales for available units are in the price range between $253,990 to $404,990 and unit sizes range from 1775 to 3311 square feet. The neighborhood is zoned to Pearland ISD, voted one of the top rated school districts in Houston. Schools include the Harris Elementary, Alexander Middle School, Pearland Junior High East, and Pearland High School. Developed by Meritage Homes, Massey Lakes Estates is a secluded Pearland community which provides residents countless outdoor activities and a fun atmosphere. Its most unique feature is the energy efficiency capability of each home, offering homeowners a chance to spend less on utilities and more on other pertinent things. Massey Lakes Estates has convenient access to Highway 288, connecting it to three major interchanges, namely: Beltway 8, Loop 610, and the Texas Medical Center. It is also a few minutes’ drive away from key Houston neighborhoods and districts like Medical Center, Downtown, and Galleria. The average price for new construction homes in Massey Lakes Estates starts at $325,990 with lots of up to 3,883 square feet. Each house has a three to four bedroom and two to three bathroom capacity, plus a two-car garage. Most homes in Massey Lakes Estates have smart home features like advanced thermostat, smart door lock, lighting controls, and video doorbell. Located in the lively Broadway Street of Pearland, Tranquility Lakes Estates is one of the more popular new construction communities in the area. Just 15 minutes away from Downtown Houston, this new neighborhood in Pearland provides future residents with convenience and accessibility Beltway 8, Sugarland and TX-288. Tranquility Lakes Estates is also just a quick drive away to one of the largest medical complexes in the state. It is also within close proximity to several nature parks and its schools are zoned under Pearland ISD, voted one of the top rated school districts in Houston. Future residents are treated to eight home design choices that occupy at least 2,500 sq.ft of land and includes four bedrooms, three baths and three garages. Home prices start at the $300,000 range. Southern Oaks is an intimate community where residents can experience seclusion from the busy districts in Greater Houston, yet enjoy easy access to it whenever they please. Developed by Beazer Homes, this is the most recent community in the Pearland neighborhood having started opening its doors to homebuyers only in 2018. Its prime location gives access to major roads like Highway 6 and Highway 288, as well as the interchange at the Texas Medical Center. 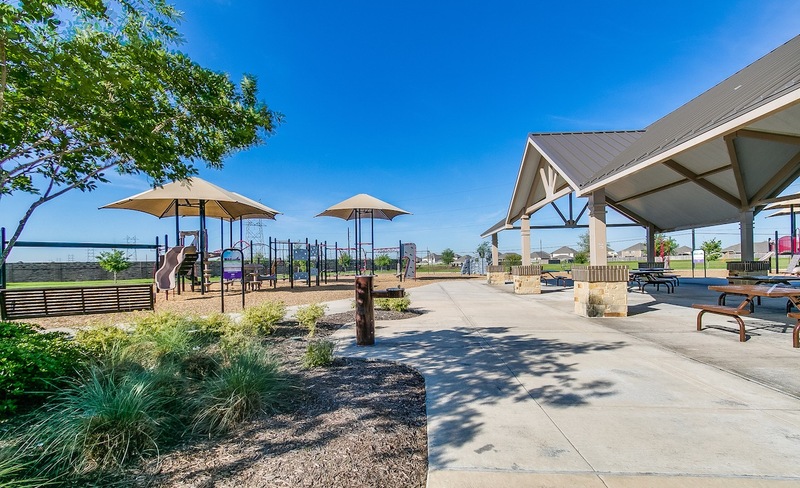 Community amenities include just a two-mile drive to Pearland Town Center, schools part of the Alvin ISD, greenbelts and lakeview spaces, and waterfront homesites. New construction homes in Southern Oaks sit on 2,293 square feet lots with a three bedroom and two bathroom capacity, and an average home sale price of around $298,482.